Details relating to the Maltese Commemorative of 2017. 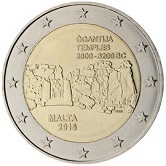 This coin commemorates the prehistoric temples of Hagar Qim. It is the second in Malta’s seven part series on “Prehistoric Sites of Malta” and is in UNESCO’S World Heritage Series. The temple complex is believed to have been built around 3200-3600 B.C. – so over 5000 years ago! In the inner circle we see the South Eastern façade of the South temple. The entrance to the temple is on the bright. In the upper right quadrant is the inscription:” HAĠAR QIM Temples3600-3200 BC”. Diagonally opposite in the bottom left quadrant “MALTA 2017”. At four o’clock are the initials of the designer “NGB”. The coin has no mint mark. Return from Maltese Commemorative 2017 to euro coin collector.